We invite proposals for the open use observations of the KaVA, EAVN. It will provide opportunities of VLBI observations at 22 and 43 GHz for astronomers in the world. The very long baseline interferometry (VLBI) technique offers angular resolutions superior to any other instruments at other wavelengths, enabling unique science applications of high-resolution imaging of radio sources and high-precision astrometry. 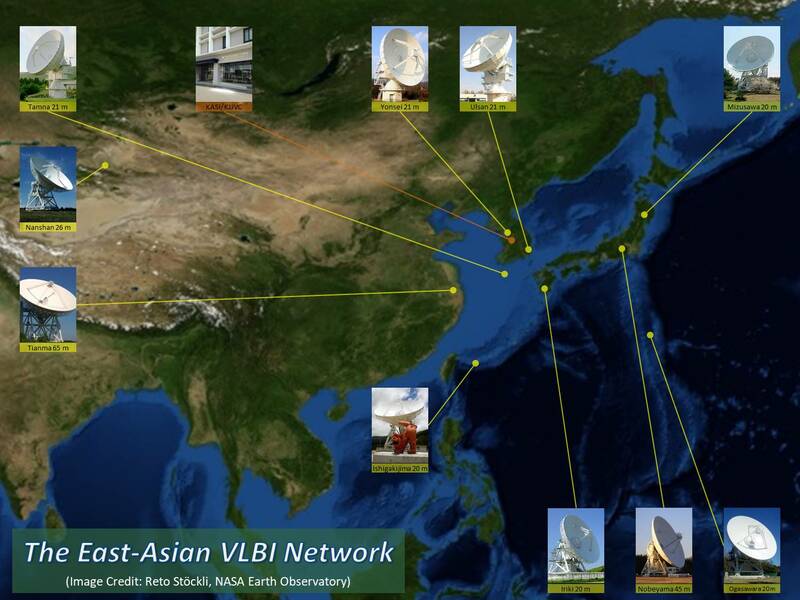 The East Asian VLBI Network (EAVN) is a collaborative effort in the East Asian region. The EAVN currently consists of 21 telescopes with diverse equipment configurations and frequency setups, allowing flexible subarrays for specific science projects. The EAVN provides the highest resolution of 0.5 mas at 22 GHz, allowing the fine imaging of jets in active galactic nuclei, high-accuracy astrometry of masers and pulsars, and precise spacecraft positioning. The soon-to-be-operational Five-hundredmeter Aperture Spherical radio Telescope (FAST) will open a new era for the EAVN. This state-of-the-art VLBI array also provides easy access to and crucial training for the burgeoning Asian astronomical community. Location of EAVN sites, KVN three 21-m telescope in Korea, VERA four 20-m and Nobeyama 45-m telescopes in Japan, Tianma 65-m and Nanshan 26-m telescopes in China, and the Korea-Japan Correlation Center at KASI, Korea, overlaid on 'the Blue Marble' image (image credit: NASA's Earth Observatory).